Queen’s Regiment, originally uploaded by Mic2006. 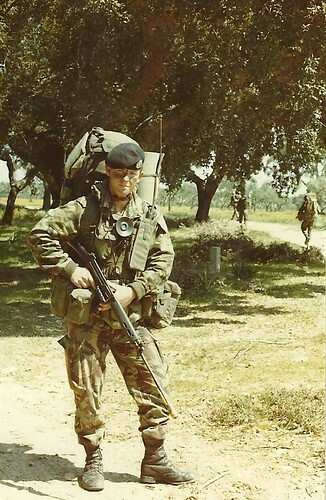 Having served a short time in the Canadian Army I left and joined the British Army (Queen’s Regiment). This is me in Portugal. We spent a huge amount of time in the eucalyptus forests. I remember that we were always short of water. I was so thirsty once that I filled an old pop can that I had found with stinking water from a tire rut. In plugging the end with plastic I had saved it for a treat later in the day. It turned out that there was an orchard near there and the people who were picking oranges gave us fresh water and lots of fruit. Most of the time we moved at night and I honed my map and compass skills to perfection. 13C – 3RCR (Hohenfels), originally uploaded by Mic2006. Behind me is a 50 cal. I can’t recall the exact issue with the APC, but I believe it was something to do with the track tension which seemed to be an on-going thing. What I later came to regard as quite odd was that not everyone in the section knew how to use the 50 cal. I believe you needed a special course. In the British Infantry (as I later joined the British Army), if there was a weapon in your section – you knew how to use it. Canadian Grain, originally uploaded by Mic2006. 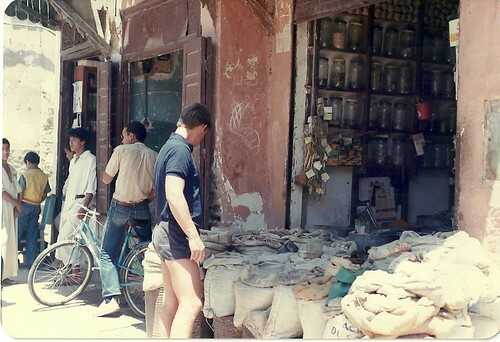 Here is an interesting little discovery in a market in Marrakesh some time in the early 1980s. Many of these sacks were labeled something to the effect, “Gift from Canada – Canadian grain for Ethiopia”. I cant remember the exact wording but it was something like that. Any thoughts as to the confusion between Morocco and Ethiopia? Admittedly they are both in North Africa, but one was on the eastern edge of the continent in the midst of a terrible famine and the other is on the western edge with no such kind of problem. Do you suppose there is a deficiency in the geographical education of the pilots or ships captains who got the product here? Maybe in the interests of conservation the Ethiopians decided to send product from their own country to Morocco in those same sacks in which they’d received their aid supplies. I had this picture taken as discretely as possible so as not to create a stir. As you can see nobody seems too bothered. If I could have got closer without a problem I would have. If you are wondering who Col is, he is the guy with the sandbag in the middle – full name is Colin. 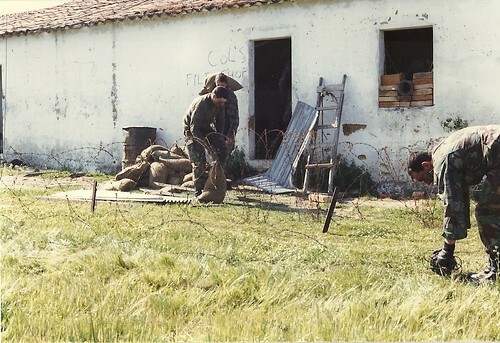 The Queen’s Regiment (1st batallion) was big on FIBUA and DIBUA, and we spent some time in Portugal instructing those practices to the Portuguese military. I can’t say it was all that effective as we didn’t speak Portuguese. What we were doing here was fortifying an old abandoned farmhouse (an exercise) and if I recall correctly, it was quite a mess inside (hence the name). The usual deal with DIBUA (defence in built up areas) is to make it real costly for the opposing force to try and take your position. There were many ways to make the battle a little slice of hell for your opponents. Walls, windows and stairways all needed to take their toll. (remember the lessons of Stalingrad). Think how can I arrange this house to kill whoever might want to visit? The defender needs to be the ultimate malicious host. And guests, they arrive not by a polite tapping at the door, but in an unexpected showering of bricks as their mouse hole charge opens a crawl way through the wall. And don’t expect a bottle of chardonnay – it’s grenades that are coming next! Success for the aggressor is based on, speed, momentum and a solid supply line to keep the ammunition coming and efficiency to keep the dead and wounded flowing back to where they came from. My father had always said that sleeping in a hole was comfortable and warm. I beg to differ! 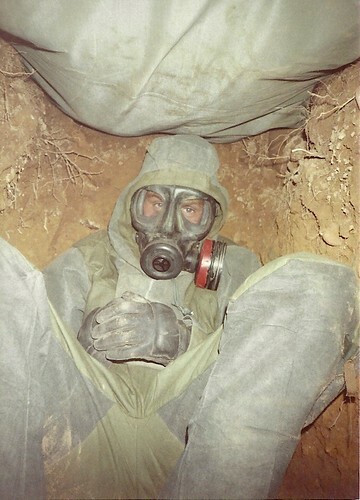 This picture brings to mind the hideousness of “digging in” while wearing NBC equipment and then experiencing some kind of air burst attack with less than lethal gas. Above Bev you can see the roof is caving in – there was dirt above and then the unpleasantness of sleeping in an NBC suit with dirt and sweat in every crease in your body. To top the experience off we had these primitive field telephones and in the middle of the gas attack where the stuff was streaming down from these big concussions above us the phone rang. I really hate the phone, but something unexplainable made me lift my mask to answer it. Well I soon wished that I hadn’t done that. Another picture from the past. I was with the Canadian Army before I joined the British Army. I took this picture in Hohenfels West Germany. These are M company’s APCs lined up in the parking lot before heading out on Exercise Reforger. 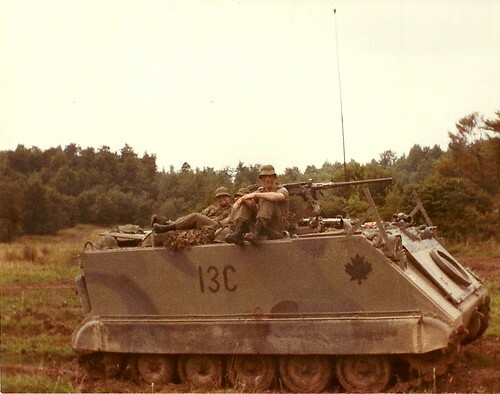 M company was one of the 5 mechanized companies that comprised the 3rd Battalion of the Royal Canadian Regiment – one of the infantry battalions that formed in conjunction with other elements, 4CMBG (Canadian Mechanized Brigade Grouping). 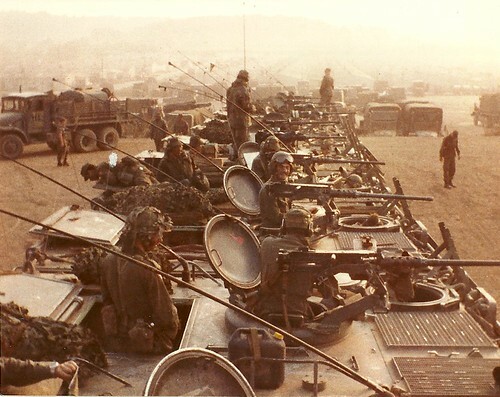 The vehicles that you are seeing here are the old M113s, each has a .50 cal mounted on top and each carries an 8 man infantry section. Reforger was quite a pleasant experience as we drove round Southern Germany. We would set up our ‘Leiger’ at night around small towns generally with easy access to the pub in mind. A leiger is a kind of defensive formation where both APCs and tanks would be holed up to rest, refuel and recover. I believe the word ‘lieger’ comes from some kind of Dutch or Afrikaans word that implies a defensive position of circled wagons. The problem is that a Leopard tank despite its armor can be quite vulknerable, but conversely it has massive hitting power under the right conditions. I had a grand old time – officially rehearsing our role of repelling a Russian advance through CENTAG. Fortunately the Russian never came.